Figure 2. Vanguard rocket on the launch pad. Figure 3. Cutaway diagram of the Vanguard. Vanguard was an early United States Navy-led project intended to launch America's first Earth satellite (see Figure 1). It began in 1955, at a time of intense interservice rivalry, having been selected ahead of two competitors based on the Redstone and Atlas launch vehicles. The fact that this decision was a mistake is now well documented. Multiple launch failures marred the project and it was beaten to its goal by both the Soviet Union with Sputnik 1 and the United States Army with Explorer 1. However, it eventually succeeded in placing three satellites in orbit. Shortly after the final launch, the Vanguard program was abandoned. 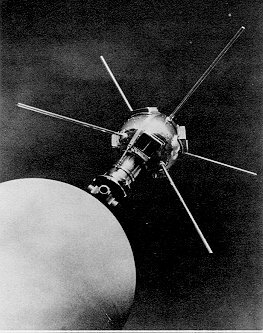 Vanguard 1 was the second American satellite and the fourth spacecraft overall (the Soviet's having launched Sputniks 1 and 2 in 1957) to achieve Earth orbit. Its two radio transmitters, which also functioned as temperature gauges, continued to transmit for seven years. Vanguard 1 remains the oldest man-made object in space, expected to orbit Earth for about 1,000 years. Vanguard 2 returned the first photo from space. Vanguard was also a small three-stage rocket used in the Vanguard program. 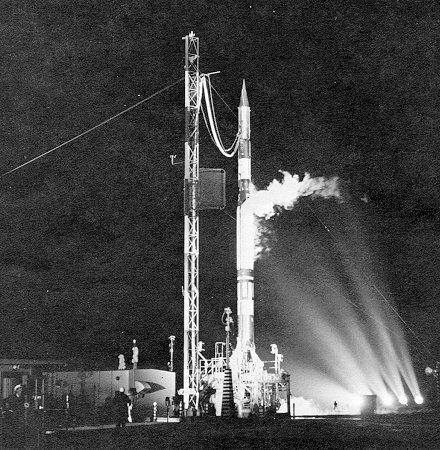 Only four of seven test launches (designated TV for "test vehicle") were successful, including TV-4 which placed Vanguard 1 in orbit, and only two of seven operational launches (designated SLV for "space launch vehicle") were successful – a failure rate unsurpassed by any other American launch vehicle. Adapted from the United States Navy's Viking and Aerobee research rockets, Vanguard was designed to fulfill the Eisenhower Administration's goal of launching a small scientific satellite during the International Geophysical Year (IGY). Development of the Vanguard stemmed from a 1955 study to determine which launch vehicle would be the most suitable for launching the first American satellite. Among the proposals rejected were Project Orbiter, a Redstone-based plan put forth by the Army Ballistic Missile Agency (ABMA). At the height of the Cold War, Eisenhower was sensitive about allowing the military to launch the first American satellite. Although it was based on the Navy Viking, the Vanguard program, proposed under civilian management, was selected. At least six Vanguard rockets had been scheduled for test launches prior to what would have been the first American attempt to launch a satellite. Since the IGY extended from July 1, 1957, through December 31, 1958, it was believed there was plenty of time for the Vanguard to prove itself before attempting to launch a satellite. However, technical problems quickly surfaced, and the first test launch did not occur until December 8, 1956. A second test launch was conducted on May 1, 1957. Before a third Vanguard test launch could occur, the Soviet Union shocked the world with their launch of Sputnik 1 on October 4, 1957. The third Vanguard test launch was conducted about three weeks later on October 23, 1957. To counter this unexpected Soviet achievement, which was followed by their launch of Sputnik 2 on November 3, 1957, a bold decision was made to attempt a satellite launch aboard the next available Vanguard rocket, a "Test Vehicle" called TV-3. This launch would occur prior to the conclusion of the test series originally intended to prove the worth of the Vanguard rocket. Vanguard TV-3 exploded on Launch Pad 18A before the eyes of the world on Dec. 6, 1957. The first American attempt to launch a satellite had failed dramatically. 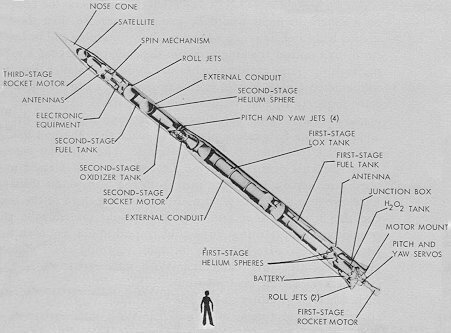 The failure allowed a vindicated ABMA to launch the first American satellite, Explorer 1, on January 31, 1958. Despite the highly publicized Vanguard failure on December 6, 1957, the Vanguard program continued. A second, but less spectacular, Vanguard failure occurred upon a follow-up satellite launch attempt on February 5, 1958. But success followed. The next Vanguard rocket carried the Vanguard 1 satellite into orbit on March 17, 1958. The next four attempts to launch satellites aboard Vanguard rockets failed, but the Vanguard 2 satellite was successfully launched on February 17, 1959. After two more Vanguard failures, the last launch of a Vanguard rocket scored a success. The Vanguard 3 satellite was successfully launched on September 18, 1959. Although retired after just 14 flights, Vanguard technology was successfully applied to other programs. Although the Vanguard project was short-lived and best remembered for one of the most spectacular failures in aerospace history, the Vanguard rocket was significant to the genesis of the American space program. The rocket's upper stages formed the basis for upper stage configurations used on Atlas-Able, Thor-Able and Scout rockets. Vanguard technology even found its way into the Apollo program, with a modified Vanguard upper stage forming the basis of the second stage of the Atlas-Antares, a rocket used to test various Apollo reentry vehicle designs.